Costa Crociere S.p.A. (Italian pronunciation: [ˈkɔsta kroˈtʃɛːre]), operating as Costa Cruises (Italian: Costa Crociere), is an Italian cruise line, based in Genoa, Italy, owned by Carnival Corporation & plc. Founded in 1854, the company originally operated cargo ships, in order to carry olive oils and textiles from Sardinia to Liguria. In 1924 the company passed to founder's sons (Federico, Eugenio and Enrico) that started commercial activities, buying the ship Ravenna. Commercial activities continued until the introduction of passenger services in 1947, with regular services between Italy and South America. The company later converted its entire fleet to full-time cruising, and as an independent company became one of the largest cruise operators in Europe. Acquired by Carnival Corporation in 2000, Costa Cruises is now one of ten brands operated by Carnival and accounts for approximately 16% of its revenue. Today, as Costa Cruises Group, the company is one of the main operating companies in the Carnival group, with executive control of the group's activities in Europe. The company is responsible for operation of Costa Cruises in Italy, and AIDA Cruises in Germany and was formerly responsible for the operation of Ibero Cruises in Spain. AIDA was previously a subsidiary of P&O Princess Cruises, being transferred to Costa following the merger of Carnival Corporation and P&O Princess in 2002. Ibero Cruises is a new brand, created in 2007 as a joint venture between Carnival Corporation and Orizonia Group. The Costa Cruises brand currently operates fourteen cruise ships, which all sail under the Italian flag and provide cruise holidays in the Mediterranean, Northern Europe, the Caribbean, the Indian Ocean, the Middle East, South East Asia and South America. The company gained international attention on January 13, 2012 when one of its cruise ships, the Costa Concordia, ran aground and capsized off the coast of Italy, because Captain Francesco Schettino wanted to 'salute' the Italian island of Giglio off Tuscany with a close sail past at night. The captain was one of the crew to leave the sinking ship early while many passengers were still on board. The ship was left lying on its starboard side in shallow water. Thirty-two people died. Six weeks later the company made headlines again when a fire on Costa Allegra left it drifting without power for 13 hours in waters near Somalia frequented by pirates, before the ship was taken under tow. On July 27, 2014, after tugboats had slowly towed the wreck of the Costa Concordia 200 miles (320 kilometers) north from the island of Giglio over a period of five days, the Costa Concordia arrived in its home port of Genoa, Italy, for eventual scrapping. The total cost of the disaster is estimated to be over $2 billion, including $500 million for the loss of the ship and $1.5 billion for the salvage and recovery operations. On February 11, 2015, Captain Francesco Schettino was found guilty by an Italian court of multiple manslaughter, causing the shipwreck, and abandoning his passengers and was sentenced to 16 years in prison. An Italian appeals court on May 31, 2016 upheld the 16-year prison sentence. He will be released in 2031. As of 2015[update], according to Scott Knutson, vice president of sales and marketing for Costa Cruises North America, Costa was “... uniquely positioned as the only international brand that hasn’t adapted its product to the American market. That authenticity allows us to go to a certain segment of the market. It’s those vacationers who like the international experience — the food, the wine, the service." Italians accounted for 25 to 30 percent of bookings on most Costa cruises, and they were followed by passengers from France, Germany and Spain. Depending on the season or destination, North Americans could make up 5 to 15 percent of the passenger list. The "universal" language on board was English. Previously Mistral for the failed Festival Cruises and Grand Mistral For Iberocruceros. Similar to Norwegian Sky and Norwegian Sun. It is scheduled to be transferred to a new Chinese cruise line by the end of 2019. It is scheduled to be transferred to a new Chinese cruise line by the end of 2020. Currently the largest ship built for Costa Cruises and Costa Crociere's flagship. It was built specially for the Chinese market. Will be the largest ship to be built for Costa Cruises. Will be built specially for the Chinese market. Angelina Lauro (1977-1979) Chartered from Lauro Lines. The ship was destroyed by fire while docked in Saint Thomas, U.S. Virgin Islands on March 30, 1979. The ship later sank on September 24, 1979 while being towed to a scrapyard. Anna C I (1948–1971) Ex Prince line Southern Prince. Requisitioned as HMS Southern Prince in WW2. Scrapped after a serious fire in 1971. Anna C II (1971-1981) Built in 10.1955 at Wilton-Fijenoord, Schiedam yard in the Netherlands. LOA 150.3m, 19.2m, DWT 10,272, Flag Panama, Class Registro Italiano Navale. Sold in 1981 to Chaldeos Freighters Ltd and renamed Damenham. Sold to Geofman International for demolition. Broken up at Gadani beach on 2 June 1984. Andrea C (1948–1981) Built in 1942 as the Ocean ship Ocean Virtue. Converted for passenger use in1948. Scrapped in 1982. Luisa C (1947–1955) Built as the Asanao in 1919. Sold and renamd Robert Luckenbach in 1922. After service with Costa she was sold in 1955 and renamed Sula. Scrapped in 1959. Fulvia C (1969–1970) Sank July 20, 1970 following an explosion in the engine room. Bianca C (1959–1961) Sank October 24, 1961 following an explosion in the engine room. Costa Olympia (never entered service) Originally ordered for Costa Cruises. It was to be the sister ship of the Costa Victoria. Its construction was halted following the financial collapse of the shipyard. The unfinished hull was sold to Norwegian Cruise Lines and was completed as the Norwegian Sky. Costa Concordia (2006-2012) Ran aground, capsized and partially sunk on January 13, 2012. It was later deemed a total constructive loss. The shipwreck was later removed and dismantled for scrap. Costa Splendor (never entered service) Originally ordered for Costa Cruises but transferred during construction to Carnival Cruise Lines and became Carnival Splendor. Costa Allegra (1989-2012) Withdrawn from service following an engine room fire on February 27, 2012. Subsequently, sold for scrap. Costa Voyager (2011-2013) Formerly Grand Voyager for Iberocruceros, transferred in 2013,now Chinese Taishan. Costa Celebration (never entered service) The ship was inherited from Iberocruceros after its operations were discontinued. The ship had undergone a refit and was renamed. The day before the ship was scheduled to depart on its inaugural voyage, the vessel had been sold to an unnamed buyer. This was later revealed to be Bahamas Paradise Cruise Line. Costa neoClassica 1991–2018 Originally Costa Classica, received a €18 million refit in 2014 and renamed Costa neoClassica. Left the fleet in March 2018 as it was sold to Bahamas Paradise Cruise Line. See also Carnival Cruises Accidents and incidents for incidents associated with the parent company's other cruise operations. On Sunday October 22, 1961, the Bianca C was off Grenada when an explosion occurred in the engine room causing the deaths of two crew members and the ship to catch fire. Local fishermen helped rescue the passengers and crew but as the local authorities did not have the equipment to extinguish the fire the ship was left to burn until the British frigate HMS Londonderry arrived from Puerto Rico. The burning ship was in the main anchorage and would block the harbour if it sank there, so the Londonderry towed it to a different location where the Bianca C sank. On January 13, 2012, Costa Concordia ran aground off Isola del Giglio, Tuscany. The ship capsized and partially sank, killing 32 people. In 2014, the ship was parbuckled and refloated with caissons, and in July 2014 it was towed to its home port of Genoa, where it was dismantled and eventually scrapped. On February 27, 2012, Costa Allegra suffered an engine room fire and went adrift in the Indian Ocean. After several days adrift without power, the ship was towed to the Seychelles island of Desroches but was unable to dock there. She was then towed to Mahé, Seychelles, where the passengers disembarked. No casualties were reported. On 9 March 2012, it was announced that Costa Allegra would not return to service with Costa, and she was given to Themis Maritime Ltd ship company. In late 2012, Costa Allegra was beached at Aliaga, Turkey, for scrapping. Costa Pacifica moored at Katakolo, Greece. Costa Atlantica approaching Miami Cruise Ship Terminal. ^ "Company profile Archived 2010-04-09 at the Wayback Machine." Costa Cruises. Retrieved on January 20, 2010. ^ "Dati Societari." Costa Cruises. Retrieved on 15 January 2012. "Sede legale: Piazza Piccapietra 48, 16121 Genova - Italia"
^ a b c "Costa Concordia Collision". DubaiBlog. 2012-01-14. ^ "2012 World Wide Market Share". Cruise Market Watch. 2011-11-20. ^ "Cruise ship Costa Allegra adrift off Seychelles". BBC News Online. Retrieved 27 February 2012. ^ "Costa Concordia reaches Genoa's main port for scrapping after 200-mile journey from wreckage site". The Independent. 27 July 2014. 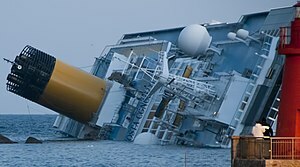 ^ "Costa Concordia captain Schettino guilty of manslaughter". BBC World News. 11 February 2015. ^ "Costa Concordia "Captain's Prison Sentence Upheld by Italian Court"". Time. 31 May 2016. Retrieved 10 August 2016. ^ Staff, CIN (2018-02-06). "Costa and Juventus Partnership Kicks Off Aboard Costa Serena". Retrieved 2018-02-09. ^ "Overnights and unusual destinations mark new Costa project". ^ "Grand Mistral South America season cancelled, ship transferred to Costa". ^ a b "Costa Atlantica and Mediterranea Sold to New Chinese Brand". cruiseindustrynews.com. 2018-11-06. Retrieved 2018-11-18. ^ a b Staff, CIN (30 December 2015). "Carnival Announces Newbuilds for Costa, Princess and P&O Australia". ^ "Construction of LNG-powered cruise ship Costa Cruises NB-1394 begins at Meyer Turku shipyard". 2017-09-13. Retrieved 2017-09-15. ^ Staff, CIN (2 August 2017). "Costa Confirms: Victoria Back to Europe, neoClassica Sold". ^ Hannah Sampson (10 March 2012). "Micky Arison on Costa Concordia accident: "I am very sorry it happened."". The Miami Herald. Retrieved 19 March 2012. ^ Gene Sloan (9 March 2012). "Fire-damaged cruise ship Costa Allegra will not return". USAToday. Retrieved 19 March 2012. Ceserani, Gian Paolo; Piccione, Paolo (1998). Costa Crociere: cinquant'anni di stile [Costa Cruises: fifty years of style] (in Italian). Cinisello Balsamo, Milano: Silvana Editoriale. ISBN 8882150976. Dellacasa, Erika (2012). I Costa: storia di una famiglia e di un'impresa [The Costas: the story of a family and a business] (in Italian). Venezia: Marsilio Editori. ISBN 9788831713030. Peter, Bruce (2012). Costa Cruises. Ramsey, Isle of Man: Ferry Publications. ISBN 9781906608408. Piccione, Paolo, ed. (2002). Costa crociere: ritratto di una flotta : storia per immagini delle navi Costa [Costa Cruises: portrait of a fleet: picture story of the Costa ships] (in Italian). Cinisello Balsamo, Milano: Silvana Editoriale. ISBN 888215386X. Piccione, Paolo; Fochessati, Matteo (2003). Crociere nell'Arte: arte a bordo delle navi Italiane [Cruising into art: art on board Italian liners] (in Italian and English). Genova: Tormeno. ISBN 8884800595. Piccione, Paolo; Ceserani, Gian Paolo; Palazzini, Fiora Steinbach (2008). Sessant'anni di crociere Costa: 1948-2008 [Sixty Years of cruising with Costa: 1948-2008] (in Italian). Cinisello Balsamo, Milano: Silvana Editoriale. OCLC 860565092. Wikimedia Commons has media related to Costa Cruises.